Kostas Tagalakis Fixer / Location manager The last 10 years has build an extended archive of spaces in Greece, holds a Master in Audio-visual Management (EMAM) and BA’s in Cinema TV and in Graphic Design. Has the ability to comply to the vision of a director and fully meet production’s demands. Great social skills. Thelyia Petraki Director / Producer Graduated from Cal Arts USA in Film and Video, is an experienced producer and coordinator with great love for films. 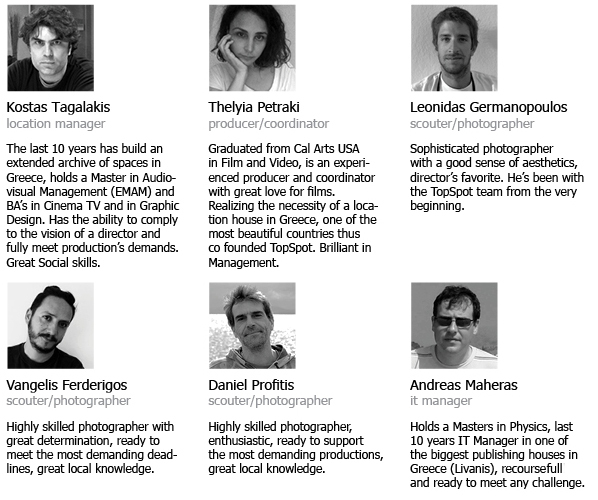 Realizing the necessity of a location house in Greece, one of the most beautiful countries thus co-founded TopSpot. Brilliant in Management. Olga Kolisoglou Production Coordinator Experienced production coordinator with a proven track record of working and offering services in productions at Greece and other countries. Qualified for many aspects of the Film Production Business. Daniel Profitis Scouter / Photographer Highly skilled photographer, enthusiastic, ready to support the most demanding productions, great local knowledge. Andreas Machairas It manager Holds a Master in Physics, last 10 years IT manager in one of the biggest publishing houses in Greece (Livanis), recoursefull and ready to meet any challenge.